Capture expansive shots of coral reefs and whale sharks with your Sealife DC-series underwater camera and this 0.5x Wide-Angle Dome Lens, which features a depth rating of 200'. It allows you to get within 4" of your subjects while still fitting everything in the frame, so that you can benefit from the coverage, color, and clarity you want--without having to compromise. The lens increases your angle of view by about 100%, making it 100° on the DC2000 camera and 120° on the DC1400. Its effective focal length is 16mm on the former model and 14mm on the latter. Additionally, the optic consists of 5 glass elements in 5 groups, which feature anti-reflection multi-coatings to maximize light transmission and prevent flare. 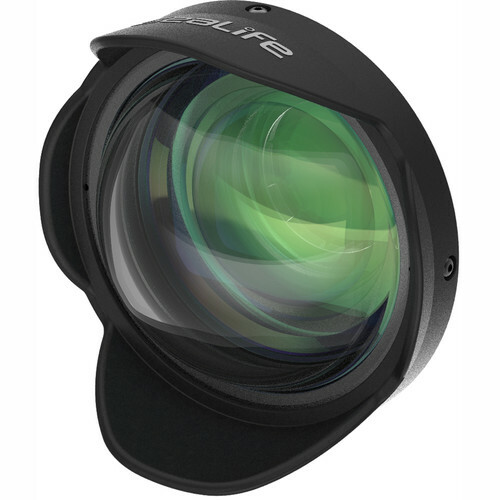 Sealife's 0.5x conversion lens attaches to your camera via the included 52mm adapter and threaded mount. It's compatible with all Sealife DC underwater cameras and many third-party models with 52mm threads. The lens can be attached and removed easily while underwater. Box Dimensions (LxWxH) 6.9 x 6.4 x 5.0"
This will come with a neoprene lens cover.